IT all started with a man who mistakenly thought that there was an armed group in an abandoned house in the outlying village of Tagpangi on Tuesday night. 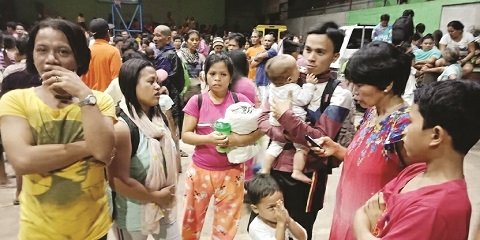 Before midnight, at least four thousand people, all scared of an imaginary enemy, sought refuge in a barangay facility in Lumbia and turned it into an evacuation center. Supt. Mardy Hortillosa, spokesman of the Cagayan de Oro City Police Office, blamed the mass evacuation on the dissemination of unverified and false information that found its way in social media and even in mainstream media. Hortillosa said even trolls on Facebook attempted to turn it into a political issue and even spread memes. He said he saw one meme spread on Tuesday night to discredit Mayor Oscar Moreno. Hortillosa said it was a serious matter on peace and order that should not have been politicized. “Shame on you, trolls!” exclaimed Hortillosa. Veteran journalist Froilan Gallardo said he noted that some local reporters aggravated the situation by going public with unverified information. He said a matter that could cause people to panic should be handled with care by reporters. Hortillosa said investigators traced the false information to a 50-year-old villager who told members of his family that he saw what looked to him like a lighter spark in an abandoned house in Sitio Batinay, Tagpangi. Hortillosa said the man told authorities that he thought that meant there was an armed group inside. The villager, according to the police, claimed that he saw armed men in the village even before Tuesday. Hortillosa said the man told his relatives about the “armed group.” The relatives alerted their neighbors, and then everyone started fleeing their homes. Hortillosa declined to identify the villager, saying he was taken by the police for questioning, and would be charged if found to have intentionally started the mass hysteria. Many who fled did not even know why they ran off. Over local radio, a woman named Julia said she was about to sleep when she heard her neighbors yelling and telling everyone to run. Fearing the unknown, she said she took her baby and fled without asking questions. “Gibiyaan nako akong giluto. Bitbit nako akong mga anak pati na akong asawa, ug nangdagan mi. Wala nami nangaon,” another villager recounted. Officials said people started flocking at the Lumbia covered court at around 6:45 pm. By 9 pm, the facility was full to the brim with people from Tagpangi, Pagalungan and neighboring areas. Lumbia’s barangay chairman, Alexander Torralba, said not one of those who evacuated could tell him that he or she actually saw an armed group. “All of them said they ran off because they were told to do so,” Torralba said. Col. Edgardo de Leon, 403rd Brigade commander, said rumors snowballed and caused the mass evacuation. De Leon said soldiers and police officers quickly responded to Tagbangi, and checked. “Wala kaming nakitang armado doon,” de Leon said. City hall’s social welfare and development office said it counted at least 192 families who evacuated to Lumbia while a police report showed there were at least 300 families. More and more people started coming as the “fake news” quickly spread. Lumbia’s barangay chairman however said there were at least four thousand people who sought refuge in his barangay on Tuesday night. The villagers started returning to their homes at around midnight after being assured by de Leon that no armed group posed as a threat to them. The fear of Tagpangi’s villagers however was not entirely without basis. On Feb. 4, the Tagpangi barangay council chaired by Anni Grace Sabang approved a resolution that asked the 65th Infantry Battalion under the Army’s 403rd Brigade to deploy soldiers to Sitio Batinay because, supposedly, there were armed men sighted in the area. One Lodimer Jagos has also alleged that his uncle, Emer Dabatian, was snatched and beaten up by armed men in his own farm in Tagpangi. Jagos’s claims have been dismissed as false by Hortillosa. He said stories about armed men mauling a villager and instructing people in Tagpangi to buy them rice were false. De Leon meanwhile said his initial suspicion was that the rumor was intentionally spread by thieves who wanted to steal from villagers’ homes while they were away. He said whoever was responsible for the dissemination of the false information should be charged with causing people to panic.